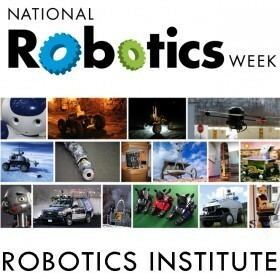 The Robotics Institute will celebrate the eighth annual National Robotics Week on April 19 & 20 with lectures, project demonstrations, the annual Mobot (mobile robot) races, and a reception for RI affiliated people. house please email Debbie Tobin at dmz@cs.cmu.edu. Speaker: RUZENA BAJCSY, NEC Distinguished Professor of Electrical Engineering and Computer Sciences at the University of California, Berkeley. By now it has become a cliché the statement that the population in industrial world is aging and hence the problem of physical agility is a serious health problem. Moreover this issue is aggravated even with younger population due to our sedative life style. It also is an undeniable (perhaps even too obvious) fact that every human’s anatomy and physiology is different. In recognition of this fact we are focusing in our efforts in development of personalized models of kinematic and dynamics of an individual during physical activities, using System Identification methodology. 1. Availability of various relatively inexpensive/affordable and noninvasive devices that can deliver the necessary parameters of the position, velocity, acceleration, masses of not only the body but individual limbs, forces generated during various physical activities. These devices are not only the standard cameras, motion capture, force plates and force sensors, Inertial measuring devices, but also hand held ultrasound cameras, Electromyography, Acoustic Myography, real time MRI infrared sensors measuring oxygen in the blood. More advanced sensors are rapidly developing. 2. Mathematical and computational tools coming mainly from the field of robotics, control theory and optimization theory that afford to reliably process all the measurements, interpret them so that they generate the individual kinematic and dynamic predictive models of the physical performance of the individual. These models predict not only the physical performance of the individual but also delineate the weaknesses of the individual. 3. Our approach is to measure/estimate the kinematic/dynamic parameters, then model and based on the performance we design interventions, i.e assistive devices to help the individual better function in daily activities. In this presentation we will show, how we use measurement of the kinematic and dynamic parameters of the individual, we will be testing the validity of our approach/our predictive performance on both healthy Subjects here at UC Berkeley and UC San Francisco medical School. Our experimental paradigm is anchored in sit-to-stand exercise. Ruzena Bajcsy received the Master’s and Ph.D. degrees in electrical engineering from Slovak Technical University, Bratislava, Slovak Republic, in 1957 and 1967, respectively, and the Ph.D. in computer science from Stanford University, Stanford, CA, in 1972. She is a Professor of Electrical Engineering and Computer Sciences and NEC chair holder at the University of California,Berkeley, and Director Emeritus of the Center for Information Technology Research in the Interest of Science (CITRIS). Prior to joining Berkeley, she was a professor of the Computer Science and information department at the University of Pennsylvania, Philadelphia. There she founded the GRASP (General Robotics and Active Perception) laboratory in 1979 which is flourishing now In 1999 she was appointed to be headed the Computer and Information Science and Engineering Directorate at the National Science Foundation. In 2001 after she finished her stay at NSF, she retired form University of Pennsylvania and joined the faculty at University of California, Berkeley. Dr. Bajcsy is a member of the National Academy of Engineering and the National Academy of Science Institute of Medicine as well as a Fellow of the Association for Computing Machinery (ACM) , fellow of IEEE and the American Association for Artificial Intelligence. In 2001, she received the ACM/Association for the Advancement of Artificial Intelligence Allen Newell Award. Since 2008 she is a member of the American Academy of Arts and Sciences. She is the recipient of the Benjamin Franklin Medal for Computer and Cognitive Sciences (2009) and the IEEE Robotics and Automation Award (2013) for her contributions in the field of robotics and automation. She received the 2016 NAE Simon Ramo Founders Award for her life achievements. Box lunches will be available for those who register by April 16.